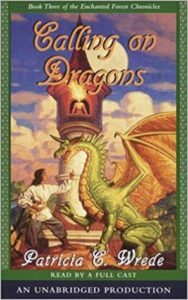 (Spoilers throughout) Dealing with Dragons has been a favorite of mine since I was a kid, but this is the first time I’ve read the rest of the series. This series, known as the Enchanted Forest Chronicles, focus on a group of characters living in and around an enchanted forest (as you may have guessed). The first book, Dealing with Dragons, introduces Princess Cimorene. She’s a misfit as far as fairy tales are concerned: she’s too businesslike to care about romance, is more interested in learning about swordplay and magic than in princess-like things like embroidery, and sees no reason to sit around waiting for something exciting to happen to her. When she learns that her parents have betrothed her to an annoying prince, she runs away and soon meets Kazul, a dragon. They soon reach an arrangement whereby Cimorene agrees become Kazul’s princess. Usually, dragons only get princesses if they can capture them and then keep away the knights and princes who try to rescue the girl. Cimorene, being no ordinary princess, is eager to help Kazul organize her library and treasure hoard, and so volunteers for the job. Soon enough she meets a few friends, and then they uncover a sinister plot by the Society of Wizards. This sets the stage for the rest of the series, which focuses on the conflict between the wizards and nearly everyone else in the Enchanted Forest and surrounding area. Each book is told from the perspective of a different human, but all of the protagonists are connected to each other in some way. Book Two focuses on Mendenbar, the King of the Enchanted Forest and Cimorene’s future husband; Book Three focuses on Morwen, a witch who is introduced in Dealing with Dragons and who is a good friend of Cimorene’s; and Book Four, the only one to be written in first person, centers on Daystar, Cimorene and Mendenbar’s son. Quests abound throughout the series: to recover a lost sword, to find a missing dragon, to find out why parts of the Enchanted Forest are losing their magic, to discover what mischief the wizards are up to. Each book also tackles well-known fairy tale tropes and dismantles them (Cimorene herself being the first and best example of this). 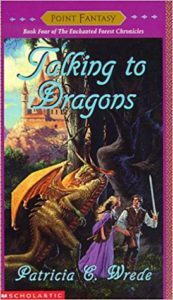 Patricia Wrede wrote Talking to Dragons (Book Four) first, and then went back and wrote the other three to fill in the backstory at the behest of her publisher. The difference shows. Talking to Dragons is the only one written in first-person. I think the writing is weakest in this one, although it’s not my least favorite of the four. Even though they were written out of order, I think they should be read in order. Dealing with Dragons is by far my favorite. Maybe some of that is sentimentality, but I think it’s also the best written of the four. It’s funny, and Cimorene is a great protagonist. Dealing with Dragons also has some real suspense to it. 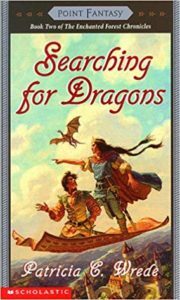 I also enjoyed Searching for Dragons, which is Book Two. This one centers on Mendenbar and Cimorene meeting and searching for Kazul, who’s been kidnapped by wizards. Calling on Dragons is the weakest of the four, and by far my least favorite. The protagonist, Morwen, is great, and it has a whole bunch of talking cats (also great), but it also has the most annoying character (Killer) in the entire series. I also hated (hated!) the ending. It’s a cliffhanger, and was necessary in order to set up what happens in Talking to Dragons, but it made me sad and annoyed. 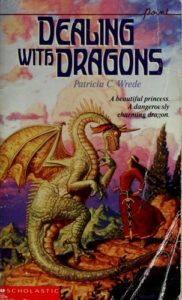 What was interesting about this is that it’s clear from the forewords that Calling on Dragons is the one Patricia Wrede wanted to write the least. She had tried to make it a trilogy, but found that she couldn’t fit all the story she needed into Book Two and so had to add an extra book to the series. I think her lack of interest shows, but I would still recommend the entire series overall. Patricia Wrede has a singular writing style. She’s very businesslike. There’s nothing extraneous or flowery about her writing or her characters. It works for this series, because even though the characters are surrounded by magic and fantasy, they are all quite no-nonsense. This contrast makes for some great humor throughout the series, and Morwen and Kazul in particular made me laugh. I can’t say that I really love her writing style in general though–in fact, I’ve attempted to read other books by her and never finished them. I think it’s that tension between her style and what she’s writing about that makes this series work. I think I first read Dealing with Dragons at around age 10, and that was perfect. I wish I’d read them all at that age. Rating: 4 stars for Books One and Two, 2 stars for Book Three, and 3 stars for Book Four. Share the post "No Nonsense Fairy Tales"
I loved, LOVED, these books as a kid. I wholeheartedly agree that books one and two are the best, three is the worst, and four is okay. Cimorene was just such a fabulous princess. I have this series on my shelf to this day so that I’m prepared for my own kiddos to discover it. Cimorene is the best. The rapport between her and Kazul is my favorite thing about Dealing with Dragons. It’s so funny that Dealing With Dragons was your first and only for a long time, because that happened to me, too! I picked this out at the Scholastic book fair, probably around the same age you did, and read it over and over. I had no idea it was part of a series until I was an adult, and then read books 1, 2 and 4 for the first time. Your review is making me want to re-read! I’m glad it’s a whole series, but it’s honestly good just as a stand alone novel! I don’t remember this book at all! I am on my way to the library website to see if I can get Dealing with Dragons. … I have my reviews of these books primed and ready to go! I was just waiting on the fifth book of short stories to post! That’s so weird that we both read the series at the same time. Maybe some sort of magic is at play…? That’s so weird! I’m looking forward to your review—I didn’t even know there was also a book of short stories!